There are many things that the US Military Industrial Complex don’t want you to know. One of the things it doesn’t want you to know is that two of its much vaunted drones are developments of a rather peculiar line of British aircraft development dating from the late 1950s. In 1955 the BBC approached the struggling aircraft company Airspeed Ltd to provide it with a dedicated aerial camera platform. It was to have excellent low speed handling and exceptional endurance to enable its crew to film sporting events or appropriate news items with maximum efficiency. A crew of three was envisaged: pilot, camera operator and director/producer. For such items as football matches it was intended that a commentator might be carried in the place of the director and the capability for live audio transfer from the aircraft was a requirement from the very beginning. A helicopter design was considered but rejected due to endurance and noise concerns. The Airspeed AS66 ‘Peeper’ was the result. Powered by a small and quiet Turbomeca turboprop derived from the Astazou, the Peeper made its first flight on the 6th July 1962 and proved an immediate success. BBC cutbacks meant that the initial order was cut from 126 to 4 but this quartet of aircraft would provide sterling service for the next forty years. Amazingly, according to a BBC correspondent, one is retained in mothballed condition at Brooklands aerodrome in Surrey ‘just in case’. Despite its great success the Peeper did present its pilots with some rather peculiar handling characteristics so a training version was developed. This, the piston-engined AS67 ‘Editor’ was much cheaper to operate but effectively mimicked the larger aircraft’s characteristics. The economical Editor was a charming aircraft to fly and cheap to operate but the asking price was high and, despite a herculean sales effort, Airspeed managed to sell a mere five examples, two going to the BBC. Fast forward thirty odd years and General Atomics is charged with developing a reliable, quiet unmanned aircraft with a good loiter time to spy on America’s enemies. Unwilling to bother developing a new airframe from scratch for a requirement that might turn out to be a dead end, General Atomics looked around for a suitable base airframe for its UAV. By this time Airspeed was long since defunct, having initially merged with de Havilland which in turn was absorbed into Hawker Siddeley and thus ultimately becoming part of British Aerospace. To cut a long story short General Atomics approached BAe with their requirements, BAe dug out Airspeed’s drawings for an aircraft designed to carry cameras with a great loiter time and the rest is history. The prototype General Atomics MQ-1 ‘Predator’, an unmanned Airspeed Editor took to the sky from Brooklands aerodrome in July 1994 followed by the larger turboprop MQ-9 ‘Reaper’ in 2001. Both have proved of great worth to US forces and are despised and feared by all manner of people the world over. In a curious footnote to this tale it was discovered in 2005 that Neville Shute, Director of Airspeed, had postulated a radio controlled ‘Queen Peeper’ in 1961 when a lost notebook of the designer/author turned up at an auction in Devon. His idea was that it could be used to film newsworthy events where a human crew would be put at risk – his example being a tactical nuclear battlefield situation. Available technology at the time simply could not provide the necessary remote control for such a vehicle but thirty years of radio and TV improvement have resulted in the ‘Queen Peeper’ becoming a reality, though not (thankfully) in a nuclear war. No. 39 Squadron RAF currently operates the MQ-9 Reaper in Afghanistan, they will be joined by No. 13 squadron during 2012. Following the lead of the Yakovlev Yak-15 (a delegation from Vickers Supermarine having visited Soviet aviation facilities in late 1945), the Spitfire F.Mk 25 was an attempt to obtain an effective jet fighter aircraft whilst avoiding the tiresome rigmarole of designing one from scratch. Shoehorning a bulky Derwent engine into the slender nose of the Spitfire did nothing for the aesthetic qualities of the aircraft, nor, as it proved, did it radically transform the performance. Despite its new powerplant the ‘Jetfire’ proved to be slower than its Griffon engined progenitor. It did, however, possess a superior rate of climb. Soon after the start of production its meagre range was improved by the addition of tip tanks. Although adequate as a first generation jet fighter the Jetfire offered only limited development potential and it was soon supplanted by true jet aircraft that had been designed as such from the start. Following Vickers decision to rationalise its aviation interests and close the Supermarine design office in 1936, the RAF’s high performance fighter needs were served purely by the Hawker Hurricane. The Mk XIV was developed as a matter of urgency following the cancellation of the Typhoon programme in 1942 due to insuperable aerodynamic problems and the simultaneous failure of the Napier Sabre to mature into a viable powerplant. 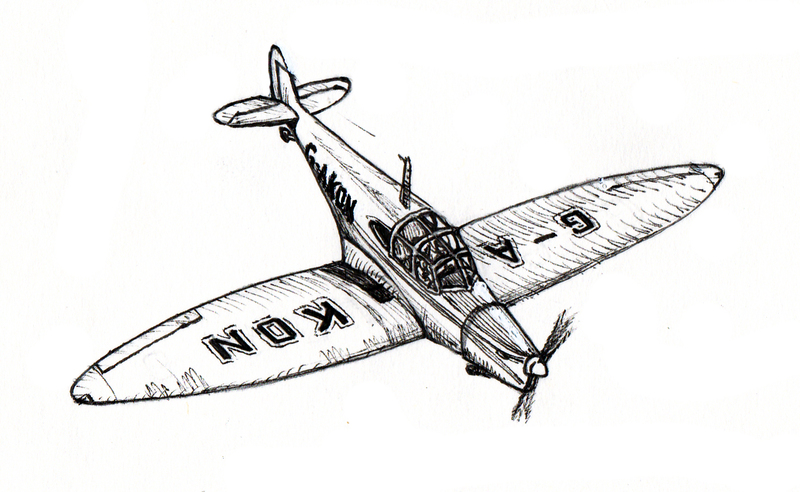 Hawker had no choice but to look to the proven Hurricane airframe and the Rolls-Royce Griffon. The Centaurus was considered but marriage of the radial engine to the slender Hurricane fuselage was rejected as too complicated. Along with the engine change, aerodynamic and practical improvements were made to the airframe. Cutting down the rear fuselage proved relatively simple due to its steel tube and fabric construction, stability was retained by use of a large fin fillet. The tailwheel was arranged to retract into the ventral fin and the large radio mast was replaced with a simple whip aerial, further reducing drag. Armament was unchanged from the Merlin Hurricane though the new aircraft benefited from a cleaner gun barrel fairing for its four 20 mm Hispanos. Give a British aviation enthusiast more than two pints and he will invariably tell you the story of TSR.2. This tale of an axed nuclear bomber will be told to you in a far more tender tone than he used to talk about his family. This bar room lecture will climax in an angry rant at the crass, penny-pinching government that killed Britain’s flying dreams. The story goes: Britain produces a world-beating aircraft, technologically superior to anything else- a fast, long ranged, survivable strike aircraft. A foolishly short-sighted Labour government cancel it. The British aircraft industry was already in terminal decline from Duncan Sandys’ mad announcement of the end of manned aircraft in 1957. 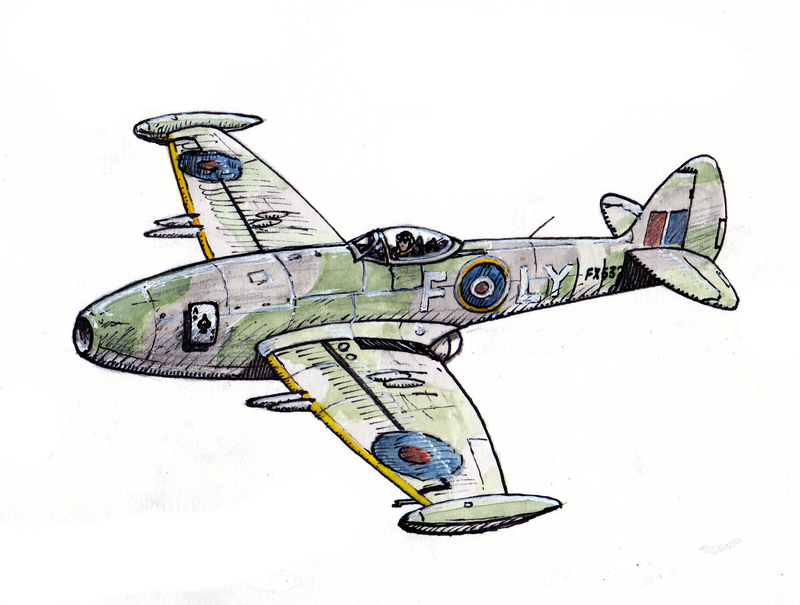 The killing of TSR.2 was the final act of vandalism, leaving the industry that had given the world the Spitfire, the Hurricane and Hunter to wither and die. This idea was fed to me from the rather good Take-Off magazines I read as a child. The story is a compelling one, it reaches into the recesses of the British psyche. It plays to the heart of a faded colonial superpower and affectionately pats the chip that sits on many British (particularly English) men’s shoulder. ‘You could have been the best, if only…’ is a powerful sentiment, and always reassuring, as it can’t be disproved. The only problem with the TSR.2 story is the foundations it rests upon are very shaky. Let’s imagine a world where TSR.2 was not cancelled in 1965…. Several events conspired to save the TSR.2 from cancellation. The replacement of the MoD chief scientific advisor Solly Zuckerman (inventor of both the helmet and ‘folly’ of the same name’) certainly helped. Zuckerman, a fierce opponent of TSR.2, quit in 1964 amid allegations that his personal beliefs regarding nuclear weapons were affecting his professional decisions. With the appointment of a new, pro-TSR.2 advisor, things were looking brighter for the ‘white bomber’, which took to the air on 27 September 1964 confounding the critics with its superb performance. Meanwhile, backroom dealings between the Royal Navy and the RAF were taking place. This unusually cordial discourse took place amid fears that inter-service squabbling could see the end of funding to both air carriers and manned land-based bombers. Though by this time RAF fears that the subsonic Buccaneer would be forced on them in place of TSR.2 were dispelled, it was clear to both services that the effectiveness of future nuclear-armed submarines threatened traditional ideas of how big air forces and navies needed to be. The Ferranti company was found to be grossly overcharging for Bloodhound missiles (surface-to-air missiles designed to defend V-bomber and Thor missile bases) and this scandal led to big questions being asked about the survivability of V-bombers in a full-scale war and lead to further support of the TSR.2. Meanwhile Prime Minister Wilson’s commitment to ‘ the White Heat’ of technology, saw R&D investment increase (though initially only for civil aircraft projects). As money poured into Concorde, the coffers were also opened for TSR.2. However, the development of TSR.2 was proving to be a nightmare. The highly advanced avionics system caused huge delays and saw the price of the project sky-rocket. To survive against the world’s biggest integrated air defence network, the bomber would use a combination of speed, electronic counter-measures and flight profiles below enemy radar. To safely fly at speeds approaching Mach 1 at 200 ft, in the murk of Northern European weather or at night would require a new technology. UK electronics giant Ferranti was charged with developing the world’s first terrain following radar (TFR) for TSR.2, which it had been working on since 1958. It initially made excellent progress, flying successful trials in its test Dakota and Canberra (WT327). The radar was first fitted to a TSR.2 in late 1965. Initial tests concentrated on testing the radar at low level (200 ft) at speeds approaching the speed of sound, it been flown this low before, but not at these speeds. The severe vibration proved too much for the pioneering radar and Ferranti went to back the lab to start a virtual redesign. 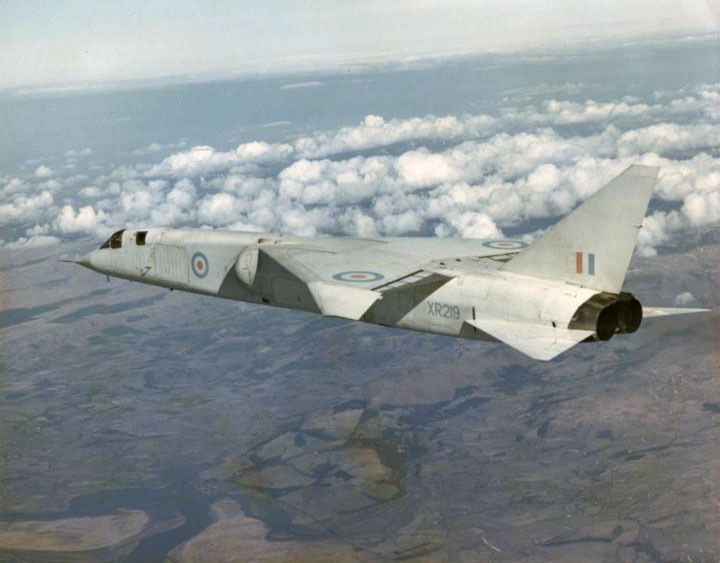 This meant that TSR.2 entered service without its most vital sensor- the radar. After soaking up millions of pounds in, the Ferranti TFR was eventually cancelled, and the UK turned to the US company Texas Instruments to provide the TFR. It wasn’t just the avionics that were causing problems, BAC itself had issues. The British Aircraft Corporation, formed in 1960, was a forced merger of English Electric Aviation Ltd., Vickers-Armstrongs (Aircraft), the Bristol Aeroplane Company and Hunting Aircraft. Though the company had one name, BAC was still a patchwork quilt of different, often incompatible cultures. 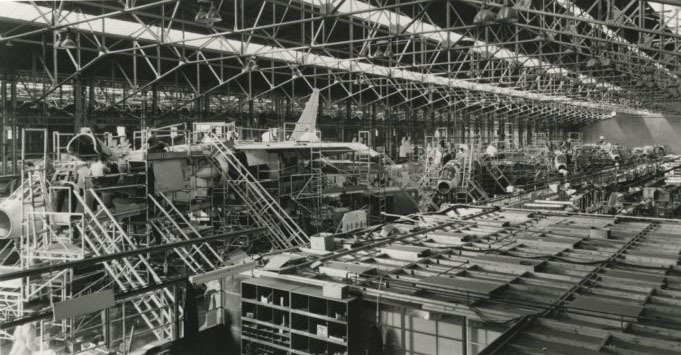 The pressure of TSR.2 development made the already fragmented world of BAC even worse, with arguments over factory work-share and work practice leading to drawn-out industrial debates, and in early 1968, the infamous strike. 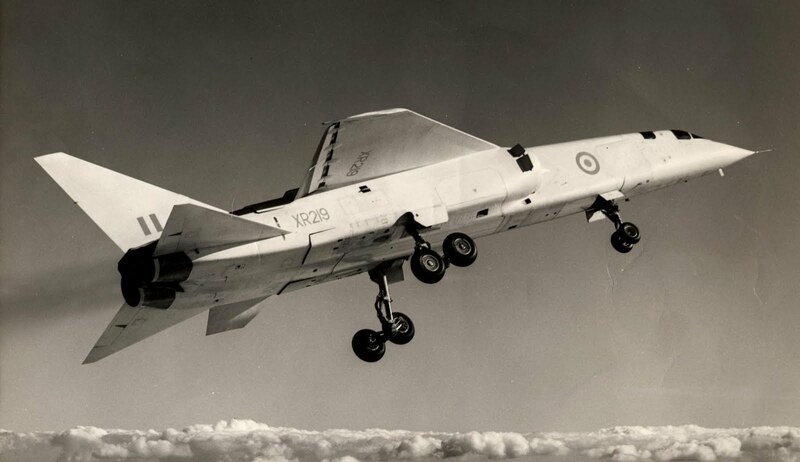 The RAF had ordered 300 TSR-2s, and the type entered service in 1969. Confident in the aircraft’s abilities, Britain was actively marketing the aircraft to several nations including Australia and Iran. This alarmed the US aerospace industry, fearful of a new contender in the fiercely competitive export market. The closest US aircraft was the F-111, which was not receiving much export interest, being seen as too expensive and complex (many air arms were also put off by its initially poor performance over Vietnam), others saw it as inflexible, as it could not perform the fighter mission. Due to its advanced nature, export limitations where also in place. McDonnell Douglas responded with a ground attack optimised F-4 Phantom II in the early 1970s. Primarily aimed at the European market, this impressive aircraft was fitted with TFR, FLIR and a laser target designator. A fuselage ‘plug’ and uprated engines gave the new Phantom impressive range/payload performance. The aircraft was dubbed ‘Strike Phantom’. The US mounted a covert anti-TSR.2 campaign, sowing doubt on the type’s maturity and highlighting the growing cost. Strike Phantom were sold to Italy, West Germany and Iran (which used them to great effect in the Iran-Iraq War). Meanwhile the TSR.2 was struggling to achieve its first export sale. Compared to the Strike Phantom, TSR.2 was big, very expensive, hard to maintain and lacking a laser-guided bombing capability. With TSR.2 going ahead the Anglo-French AFVG (Anglo-French Variable Geometry) aircraft, a swing-wing carrier compatible fighter (for interceptor, tactical strike and reconnaissance roles), was discontinued. In turn the UKVG was also not proposed and so did not lead to MRCA, which would have grown into Tornado. With the future of the ground attack mission safely in TSR.2’s hands, the Anglo-French Jaguar went back towards its Taon roots, becoming a small (marginally supersonic) trainer with next to no offensive capability. The Jaguar’s success as a trainer meant the Hawk was never built. Without the collaborative base of Panavia, attempts by various European companies to start work on a new fighter in the 1980s failed to gain momentum, and the Typhoon never was. Though in many ways a capable aircraft, TSR.2 was ultimately the aircraft that killed both Britain and Europe’s warplane industry and left it dependent on the United States. First flight 27th September 1964. The TSR.2 entered service on April 1st 1969 in interim TSR.Mk 1 standard. Upgraded to definitive Tornado TSR.Mk 2 standard with fully functioning Texas Instruments TFR in 1978. Two TSR.2s crashed on the infamous failed ‘White Buck’ mission against Argentina in 1982. TSR.2s were suggested for US attacks on Libya 1986, but declined for political reasons. Upgraded in 1986 to Tornado TSR.Mk.3, TSR.Mk.3A (recce) and TSR Mk.3B (anti-shipping with Sea Eagles) standard. UK buys 165 F-15F Eagle (enhanced two-seat F-15C fitted with Sky Flash and radar upgrade) in 1986 to replace Lightning and complement F-4 fleet. During Desert Storm the large low-flying TSR.2 (with its significant IR signature) proved vulnerable to SAMs, 8 lost (of 30 sent) to enemy, 4 lost in accidents. Fatigue problems and increased attrition rate causes a search for a replacement.The US offered F-15E and second-hand F-111s, France offered Mirage 2000D/N derivative with UK systems, Sweden offered upgraded AJ 37 Viggens. After prolonged procurement assessment the F-15G was chosen in 1994 (124 ordered). The F-15G features UK ECM equipment, weapons and Martin-Baker ejection seats. The F-15G entered service in 1998, Tornado TSR.2 was withdrawn from attack role in 2000 (after Balkans deployment). 12 recce versions upgraded to TSR.2.Mk 4As standard and remained in service until 2004, used in Afghanistan. 2012 RAF fast jet fleet: 110 F-15Fs, 100 F-15G(UK). If you enjoyed this, check out our exclusive article on Britain’s P.1154 STOVL fighter: https://hushkit.wordpress.com/2012/07/20/the-hawker-p-1154-britains-supersonic-jumpjet/ and remember to donate if you’d like to.